Need a great idea to display your Christmas Cards year round? 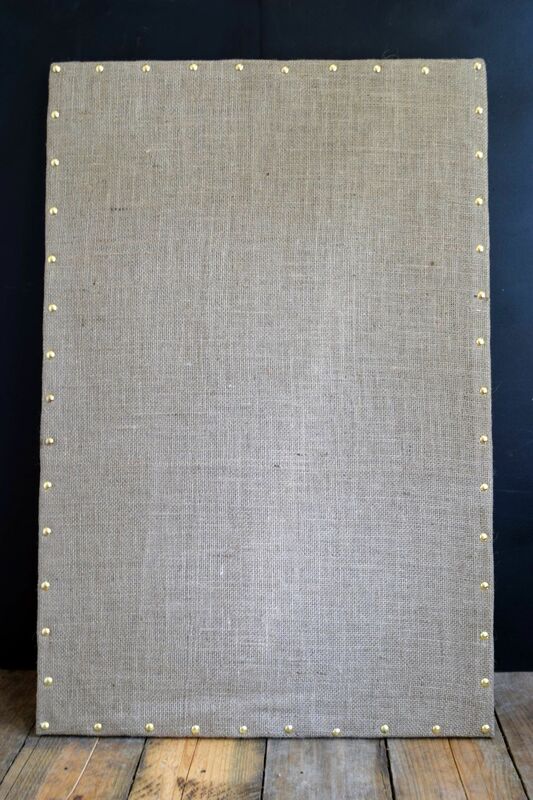 This nailhead trim burlap bulletin board would be just perfect. I have this very clever and creative friend named Jane. One foot inside Jane's home and you're awed by all the impressive decor of her home, all done by Jane. Heck, she Venetian Plastered her foyer…ALL.BY.HERSELF!! We met while volunteering at the middle school library, but quickly realized we were creative kindred spirits. 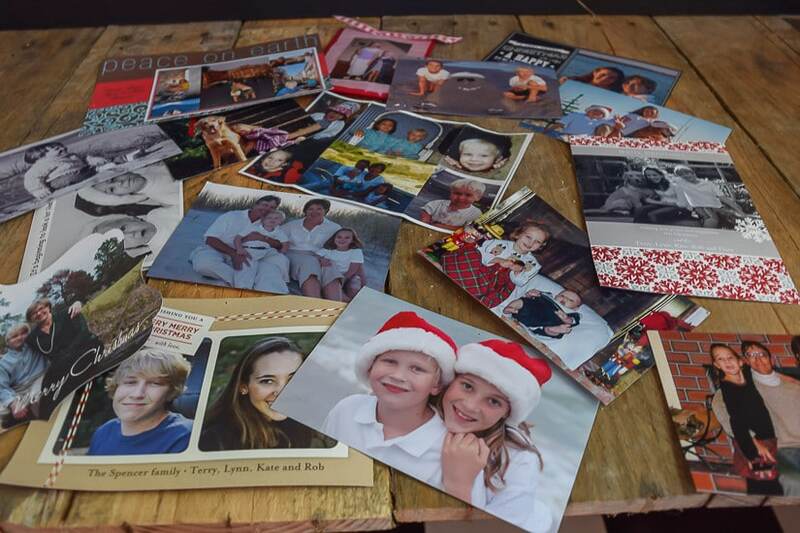 The first time I went to Jane's home, I spied a bulletin board that she kept in her laundry room which was populated by all the photo Christmas cards that they had sent out featuring their family or children. It was a great annual snapshot of how much her beautiful children had grown from year to year. Not being bashful on adopting/borrowing/stealing another's great idea, I promptly came home, rummaged through my photos and keepsake boxes and collected the Christmas cards or Christmas card photos since my when my oldest was a wee one. My next challenge was to find an appropriate collection space for these annual snapshots. Ever since refinishing the storage cube for my daughter's dorm room, I've been looking for another project to use nailhead trim on. Creative Kismet! I love it when two ideas collide to make one fantastic project. Bulletin board in your desired size. I had a 24″ X 36″ bulletin board already, so I opted to reuse it. Burlap to cover your board. 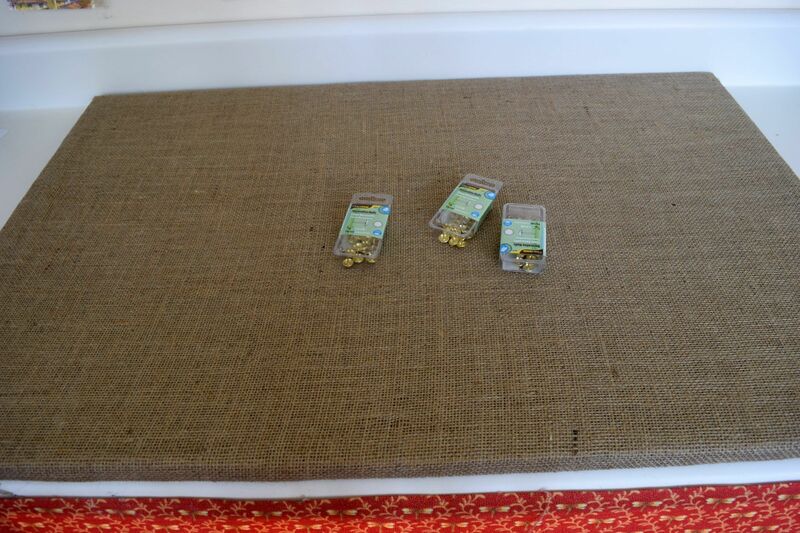 My burlap was 45″ wide, so I only need 2 1/2 feet of burlap. The burlap cost me all of $3.00! Decorative Nails. Buy more than you think you need. These nails bent rather easily (maybe it was operator error), but I ended up going through 72 (3 packages) to ultimately put 46 on my board. I got the brass, but in retrospect think the antique brass finish would've looked really cool too. Hammer or rubber mallet. I used a hammer that we had put moleskin on to prevent it from scratching the nails. Small pliers to hold nails while you hammer. First things first…WHAT NOT TO DO…Don't glue your burlap to your board first. 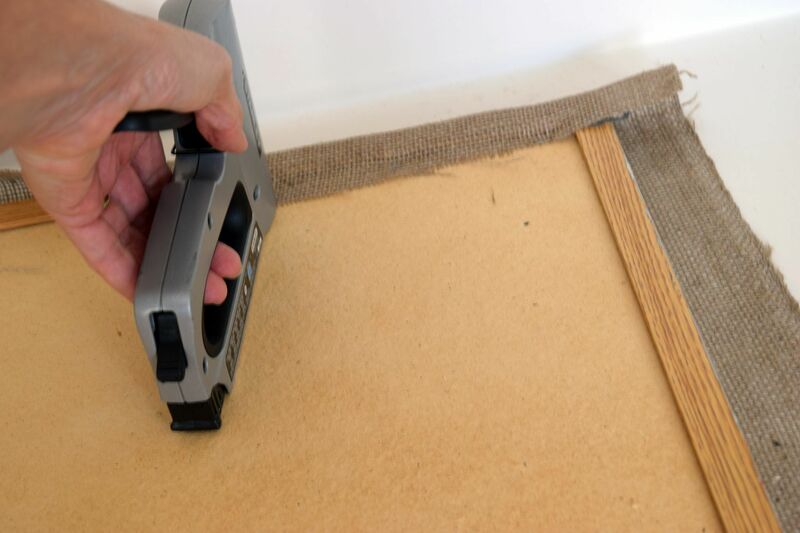 I did this seemingly clever move only to find out that the glue discolored the burlap. 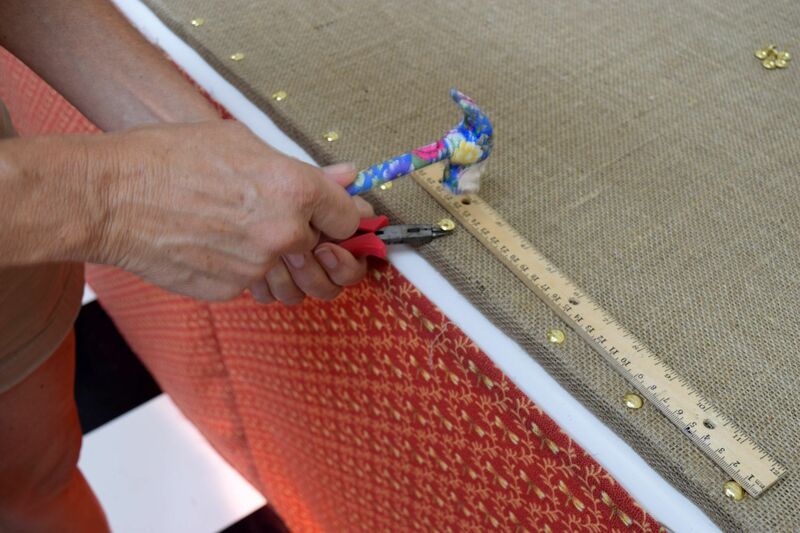 Back to the fabric store…good thing burlap is cheap! 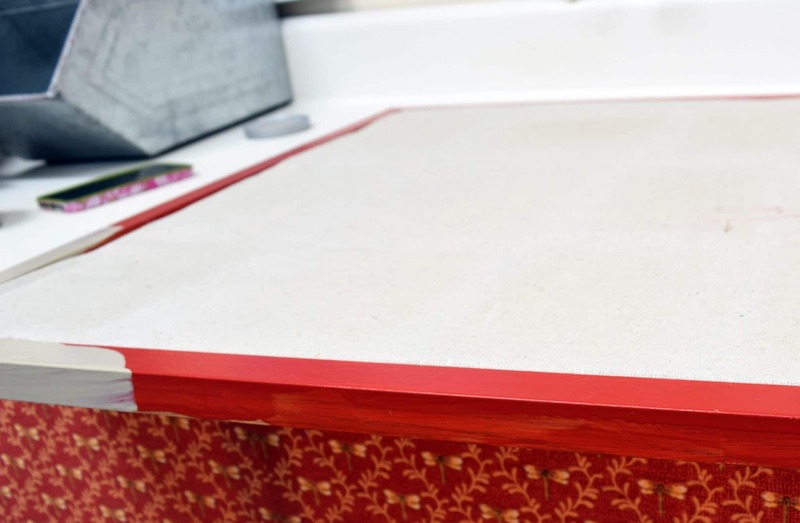 The wooden frame around my bulletin board had previously been painted red, so I gave it a coat with a neutral beige that I already had at home. 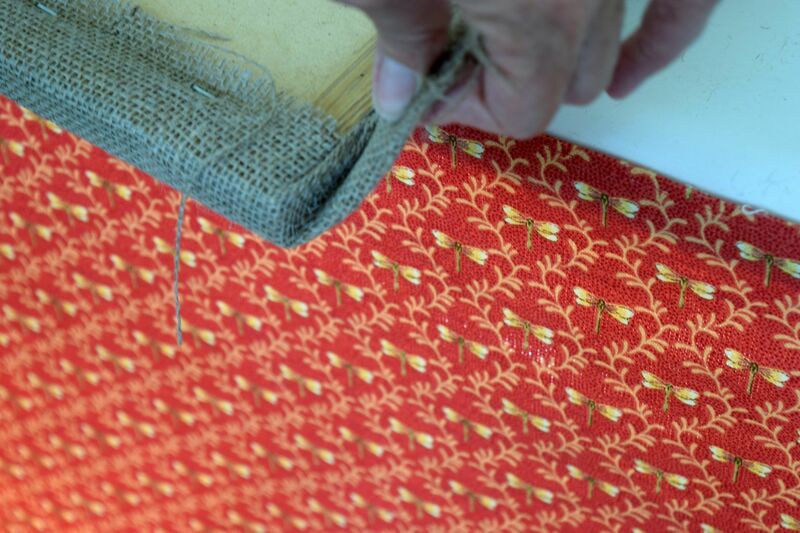 The burlap is a loose weave, so I didn't want the red showing through. I cut my burlap so that would cover the wood frame, with about 1″ extra. Staple on the back, up against the wood frame, keeping the burlap taut as you go. Corners are always tricky. I wish I could tell you exact step by step instructions, but it is a function of minimizing the fabric that will be in the fold by cutting away as much as possible, but not too much that you see frayed edges on the corner. Then I always resort to my training as a present wrapper at Sears during college…make your corners as sharp as possible and your folds as crisp as possible. Here's how I do it. This was a bit of a challenge. It seems that a 24″X36″ bulletin board is not exactly 24″x36″, but more like 23 1/8″ by 35 1/4″, which made finding equal increments with my US Standard Measuring stick a headache-inducing trial. So…I resorted to using my metric ruler and it worked like a charm. I measured every 6 cm, after putting my corner nails 1 cm in from each side. I had to fudge a few, say every 5 3/4 cm or so on some, but you'll never be able to tell unless you get up there and measure with a ruler. I did alternate from side to side, measuring between nails frequently, to make sure that I didn't end up doing one whole side and then realizing that my measurements were off. This is where you need small pliers. I think mine are actually jewelry pliers as they have a very small nose, which was perfect for this job. TA DA! Now it's ready for your Christmas card collection or just as a spiffy bulletin board. Applique/Sequin Pins. I used a size 8 or 1/2″. I made little tags to identify the year of each picture. I had some metallic gold cardstock on which I printed the years. 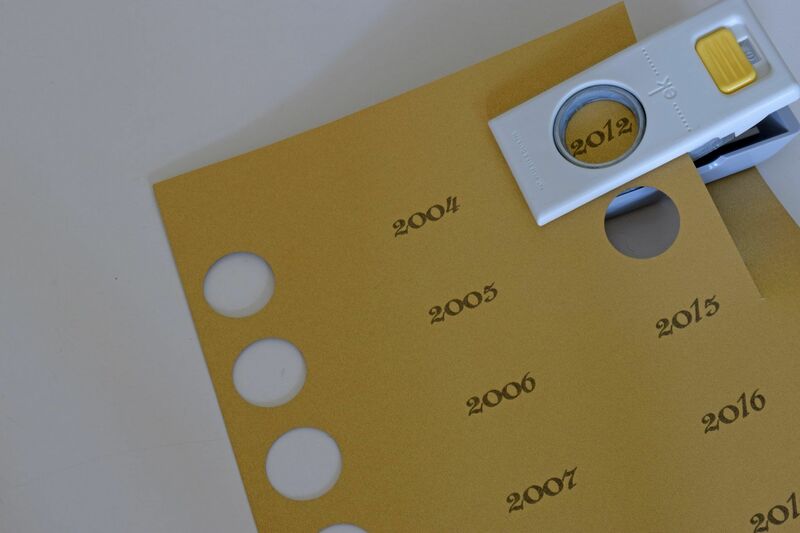 I used a 1″ paper punch to make the circle year tags. I did print up and punch out the years up to 2019 so that I can easily add the new cards to my board in the same font and with the same paper. I put the future years in an envelope that I've taped to the back of the bulletin board. 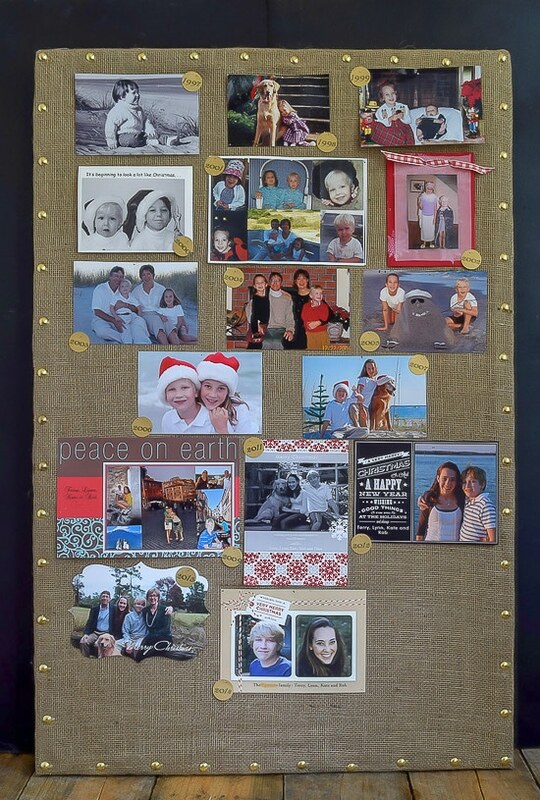 I'm loving my finished Christmas Card/Nailhead Trim Burlap Bulletin Board especially since that cute little girl in the first couple of pictures is just starting her second week away from home at college. It's a great addition to my office, which is about to get a mini-face-lift anyway. If you want it for your future reference, pin it! I have published printable PDFs of several of my most popular knit patterns and printables, including these tags, and have made those available to all of my subscribers. And come back and check every now and again. I will continue to add patterns and printables to this page as we go along. Oh, thanks! The whole reason I got into blogging was for comments like yours! Share your bulletin board when you get it done. Enjoy this beautiful day in NC! I love burlap and family photos! It’s really neat to see your kids all together, how they changed year after year! What a great piece to have in your office. Even if the kids have moved away you have them with you each and everyday! Thanks Nikki, I do love having this in my office…there are some photos that just really make me smile. Really neat idea! Thanks for sharing at the Home Matters Link Party! Hi Wendy, thanks for stopping by and I’ll see you next week.